Posted by WorldbyStorm in Espionage, Medical Issues, Russia. Clearly the Litvinenko affair has broadened and deepened. Now we discover that radioactive traces – in some cases more than traces have been found on three, perhaps four aircraft. Seemingly numerous locations around London also have similar traces. Meanwhile we now have a Dublin Connection with the strange illness of former First Deputy Prime Minister of Russia Yegor Gaidar. Gaidar was taken ill last Friday at a Russo-Hiberno (if I can coin a phrase) Conference in Maynooth where he was also launching his new book. Journalist Conor O’Clery of the Irish Times detailed on Channel 4 News how Gaidar had become extremely ill during a talk being forced to run from the room where he promptly was violently sick for some time. I think in his overly detailed description O’Clery recounted blood coming from Gaidar’s nose. In any event medical authorities believe that he seems to be suffering from some form of poisoning. A remarkable coincidence in view of the Litvenenko poisoning. Gaidar is an interesting character. Former Communist turned free market evangelist, in some respects it’s not unfair to see him as the architect of later economic problems due to his extremely liberal reforms in the early 1990s. Since he left power in 1994 he was for a time politically active, albeit in parties of declining significance, but went back to his previous career of researcher. So what to make of this? Well, rather like Litvinenko, it’s hard to the neutral eye to see Gaidar as an immediate threat to Putin or Russia. Why go to the trouble or effort of transporting radioactive materials hither and yon to remove two rather peripheral players? Why make such a meal of this transport to the point that radiation is left on aircraft. Again on Channel 4 News it was noted that it is relatively easy to contain these substances so there is no leakage. Unless of course this is deliberately portrayed as a botched job in order to deflect attention away from those responsible. And this is where this tails off into the improbable on all levels. As easy to say that it’s a deliberate ploy to make Putin look bad. How can we judge? I mentioned (and was perhaps somewhat reasonably taken to task by JCSkinner for appearing unfeeling of Litvinenko’s death which I’m certainly not – it’s tragic for him and his family) previously how this was reminiscent of the Cold War. But in a way it’s not. The Cold War was never this unhinged, never this unpredictable. Yes there was the incident with Mharkov, but that was more remarkable for being atypical than commonplace. Indeed it’s perhaps telling that it was carried out by one of the proxy states in the Warsaw Bloc. Generally speaking Cold War espionage was muted, below the surface and played out with remarkable precision by the competing powers. A final thought on the matter, if a tiny quantity of such radioactive material can cause this level of unease, it’s chastening to consider what those with grander ambitions might do given the opportunity. And gloomily intriguing that it hasn’t happened to date. Now I’m away to catch up on The State Within, because as I implicitly noted in the earlier post sometimes the comforts of fiction are…well…just more comforting than a real world of radioactive passenger aircraft. Posted by WorldbyStorm in Housing, Irish Politics, Social Policy. Wednesday has an interesting and informative post on the Affordable Housing Scheme promoted by Dublin City Council which points up the absurdities of the current situation. As it happened I was in the office of a friend of mine yesterday and she had a form for the Affordable Housing lottery. Although I knew of the lottery I hadn’t appreciated what it meant in practice. Well I was soon disabused of that lack of knowledge. She had the forms, statements validating salary and assorted legalistic stuff. And she was genuinely excited about the prospect of entering it. The brochure issued by the Council was impressively printed, full colour photographs of our current slightly fussy modernist apartment blocks from a wide variety of locations across Dublin city. Yet the telling aspect was the quantities available as against those entering the lottery. 800 here for 24 apartments there, 900 there for 16 apartments here. These aren’t great odds, in fact they’re terrible. Effectively we can expect approximately one in every 56 or so applicants to be successful. Now, I know rationally that this may well be a means of doing this, given the limited supply, but really can there be anything more irritating to those engaged in this process than a lottery? Is that what they mean when they say we’re all consumers and customers now? Where does it end? Scratch cards from newsagents? I purchased my house through the Shared Ownership Scheme in 1999. It so happened the salaries at chez WorldbyStorm were sufficiently impoverished to permit acceptance to the scheme. Despite the hassle subsequently with electrics, plastering, carpets etc it exists, and I readily appreciate the good fortune in that. Shared Ownership was no picnic. In fact it was an unbelievably depressing process to engage in with no certainty of success at any point along the way. But psychologically wearing as it was, the prospect of success was there – I’d guess that at least 50% of those who engaged in the process finally purchased properties (although I’d be interested to see statistics on this). In the Affordable Housing proces one is hobbled from the beginning. And as Wednesday points out, the real problem is the supply side. Simply put there aren’t enough properties available. Even a 20% allocation for social and affordable properties strikes me as unlikely to make a real bite in the problem – and short of significant government intervention that simply isn’t going to happen. So what do we do? As someone on the left I find the solution difficult to envision – so I’ll suggest a raft of them. A greater set aside – well to my mind yes, that’s a start. But also perhaps a reconsideration of the role of the state and private sector in this area. I’m not antagonistic to a role for the private sector in this area – but part of the problem appears to be that the private sector dominates the nature of the debate and the production process. This seems to me to be a case where regulation is necessary – and perhaps the adjustment of social policy back towards production for the state to be purchased by incoming tenants. I’m entirely comfortable with the Council being my mortgage provider. Indeed I prefer it that way for my own ideological reasons. On a slight tangent, I’m not too worried about the nature of ownership, whether it is communal or individual, within associations or not. But I think actual ownership is crucial to engender a positive and – dare I say – responsible approach to properties particularly those facilitated by the state. And that is something the left should, and perhaps is, assimilating. And also as Wednesday suggests the nature of accommodations should be looked at, but I’d put it slightly differently. Does it make sense to assume that singletons will remain single? Or family sizes will be indeterminately restricted to couples? Or build units with one-bedroom accommodation knowing that the market is more broad based than that? And incidentally, lest the market driven aspect of this be dragged in, I spent five years working for a group of companies that provided amongst other things electrical fittings and lighting to the construction sector. Having trooped through private apartment being built across Dublin in the late 1990s one of the most striking aspects of their construction was the remarkable lack of differentiation between supposedly ‘luxury’ and supposedly ‘standard’ apartments in term of size, internal layout and so on. An interesting market which promotes a grim homogeneity of product and then lauds minor difference as ‘luxury’. The reality is that other than the high end of the market these products are far too similar and far too limited and inflexible. On a broader point one of the more interesting aspects of this is whether the nature of urban living in Ireland will shift towards the European model of high density accommodation rather than estate living. So far there’s precious little evidence of the former and rather too much of the latter. But as to the present am I alone in finding the concept of a lottery somehow a ‘dumbing-down’ of the process and an insult to both the intelligence and entirely reasonable expectations of those who seek a place of their own in this city? This was brought to my attention (thanks Fergus) at the weekend. 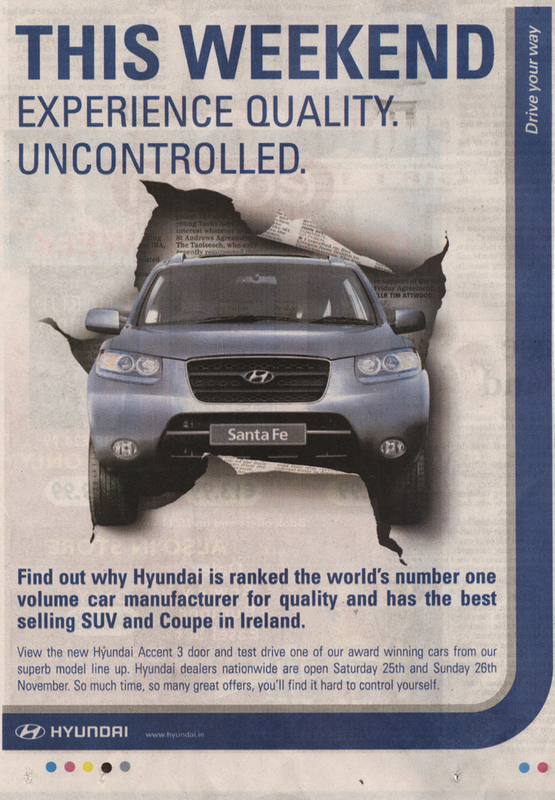 An advert (in the Irish Times) for Hyundai no less, and one of their more fearsome vehicles literally crashing through the page of newsprint under the heading “This Weekend Experience Quality Uncontrolled”. 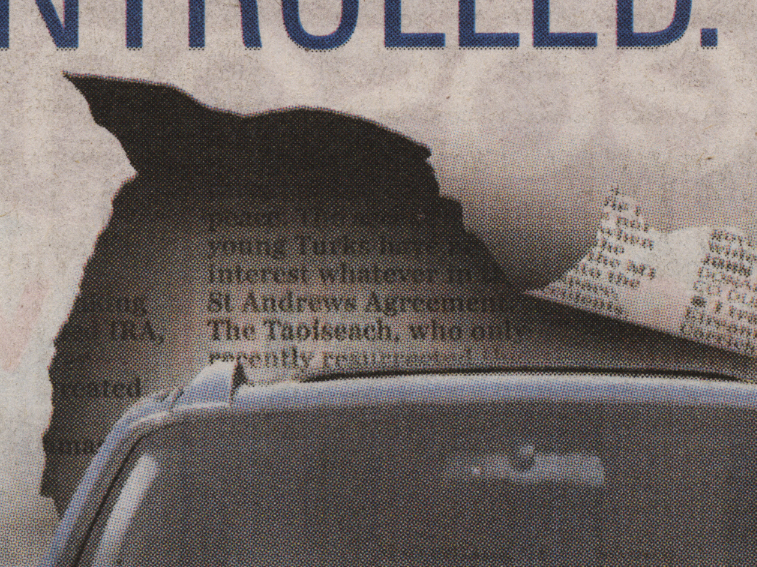 But worth noting is the small print at the top of the vehicle on the sheet ‘beneath’ the torn newspaper…which mentions the St. Andrews Agreement and The Taoiseach [click on the image to see the full size version]. Subliminal and topical at the same time? Now, you don’t see that every day! The Litvinenko affair is a curious one as noted by Dublin Opinion. The former FSB agent, now working with adversaries of the Putin regime falls ill and then dies from what appears to be radiation poisoning. Immediately the UK press appears to decide that this poisoning is the responsibility of the Russian state security services, and practically indict Vladimir Putin (former head of said state services under Yeltsin). It’s not as if the Russians had no form in these areas – look at Georgi Markov, an Hungarian dissident allegedly done in by the Hungarian intelligence services in alliance with the KGB through the means of a poison delivered by the tip of an umbrella. This was of course in 1978. But this is a murky world. Only this year in January we saw claims and counter-claims about a British spying ring led by four diplomats in Moscow. In a particularly theatrical flourish a ‘fake rock’ with electronic devices contained with in was produced by the FSB as proof of the malfeasance of the British. In a way this is amazing stuff – bar Litvinenko’s death – because it seems to point back to good/bad old days of the Cold War. And here I want to shift away from Litvinenko to something that has struck me over the past ten or fifteen years. 1991 and the implosion of the Soviet Union was arguably a good day for democracy – but quite a bad one for a particular art form, that of the thriller. A generation of writers, Len Deighton, Craig Thomas, even Ian Fleming, had utilised the seemingly existential threat from the Soviet Union as a means of shaping their fiction. Book after book was produced in which the Soviets were either front and centre or provided a satisfying foil for intelligence agencies of one stripe or another. And the beauty of it was that the Soviets, and by extension the Cold War, were the perfect adversary. One fueled by a seemingly voracious ideology, but one that was rather mysterious. The drabness of the Soviets was well known, but that’s to forget a whole host of significations that came with it, guile, intelligence, allure, technological prowess in certain areas, a seedy glamour and so on. And many of these thrillers were played out against seemingly glamorous locations that symbolised both the elitism of the post-war world – Alpine ski resorts in On Her Majesty’s Secret Service by Fleming, neutral Portugal in Horse Under Water by Len Deighton, the Finnish border in Craig Thomas’s The Bear’s Tears – and a curious sort of consumerism as lifestyle as that sort of elitism was blurred as class barriers began to diffuse a little, large scale international travel moved towards the norm and living standards rose. Perhaps it’s not so surprising in that context, where jet travel was, if not quite a commodity, near to a commonplace that the plots of the Bond films became more and more absurd as they attempted to stay one step ahead of the masses and their delights. But on the level of geo-political intrigue as played out by more serious novelists such as Le Carre, Julian Rathbone and indeed Deighton (a superb writer utterly unappreciated as such), the Soviets as leaden and gray as they were replaced by a Confederation of Independent States which somehow provided much less intellectual and ideological traction for novels. Sure, there were a raft of post-Cold War novels, with plots revolving around cleaning up the messy aftermath of agents cut adrift, or intelligence units unable to come to terms without the grand game. But these were largely tepid affairs. Le Carre moved onto pastures new, best symbolised by The Constant Gardener where the enemy is no longer in the east but is in truth here, with us somewhere in our house. The corporations are alright as an adversary, but there’s little glamour in the profit motive as generations of libertarian authors from Rand onwards have discovered to their cost. Julian Rathbone gave up writing thrillers and concentrated on entertaining and warped visions of English history. Craig Thomas vanished after a series of increasingly depressing volumes the last of which wound up in Burma depicting collusion between a Labour government and the junta there. Len Deighton wrote the puzzling Mamista about Southern American revolutionaries before a sort of Raymond Chandler style pastiche entitled Violent Ward and then too vanished. Elsewhere it’s been lean enough times for those thriller writers who tried to engage with the new Soviet-less world, despite the ever increasing size of their volumes, as represented by the Tom Clancy’s of the world. There’s something unsatisfying about Al-Queda as an enemy. China is perhaps too far away. Our own local bit of difficulty began to be resolved a little too soon after the end of the Cold War. Some authors went the Fleming/Bond route, such as Daniel Easterman who never heard a conspiracy theory he didn’t like. His increasingly convoluted thrillers revolved around extreme Catholic conspiracies, neo-Fascist conspiracies, Russian nationalist conspiracies etc. Still. Perhaps now the time is ripe for a renewed concentration on the traditional Russian focused thriller. Bugs in rocks in Moscow. Radioactive murder, and who knows what else? A resurgent Islam. Racism, xenophobia and fascism too. A centralising state recentralising fast. Who knows how the next Presidential elections will turn out – eh? Really, when one thinks about it, perhaps it’s time to start writing those thrillers again. Posted by smiffy in Ethics, Medical Issues. Fans of angels-on-the-head-of-a-pin philosophical internet discussions (you know, the ones that usually end up with a virgin being thrown into a volcano, and admitting that cannibalism isn’t so bad after all) could do worse than checking out a documentary on BBC2 tonight, entitled “Monkeys, Rats and Me: Animal Testing”. If there is a defining moment in this outstanding documentary, it is the sight of young Sean Gardner – crippled since childhood with the neurological disorder distonia – taking his first hesitant steps from his wheelchair. Only the heartless would not be moved by the delight on his face. The means by which Sean’s mobility was restored is clear from the programme’s title, of course: he was the beneficiary of an operation perfected through animal experiments. Thus we meet the men and women who experiment on animals to help the crippled and sick. Take Oxford’s Tipu Aziz. He drives electrodes through monkey’s brains to develop techniques like the one that saved Sean. Thousands have benefited, he says, while only about 100 monkeys were sacrificed. These scenes – presented in unflinching detail – are then counterpointed with footage of the ragged army of fanatics who have pledged to end animal experiments in Britain. Their activities are focused on new Oxford 18m animal laboratory, now the country’s key anti-vivisection battleground. Every week dozens gather to howl obscenities at construction workers. ‘Why don’t you do something worthwhile, scum?’ screams a protestor who clearly thinks hanging around a building site intimidating people defines ‘worthwhile’. Certainly, it is hard to find much sympathy for those people, though director Adam Wisehart tries. He makes no secret of his unease about monkey experiment, but in the end accepts their justification. Thus he provides answers to two key questions: does the alleviation of human pain justify harming laboratory animals, and does these creatures’ suffering justify the tactics of campaigners? It is ‘yes’ to the first and a definite ‘no’ to the latter, says Wisehart, and I suspect most viewers will agree. Sounds fun, no? I might even choose to watch it, instead of something about robots. If so, however, I hope the programme is better than its description, which doesn’t really do justice to the complexity of the debate on scientific experimentation on non-human animals. In an argument which is often presented in terms of heartless clinicians teaching Beagles to smoke, or violent crusties digging up corpses because they hate humanity (no prizes for guessing which stereotype the Observer’s reviewer tends towards) perhaps I might try to sketch out briefly some of the key points which are often overlooked in a struggle which generates a lot of heat, but very little light. I don’t want to prejudge the programme itself, but it seems fair to say that it’s hardly going for the hard cases with the example of a child taking its first steps to illustrate the benefits of animal testing. Surely only a monster would want to deny Sean Gardner the ability to walk simply because a few monkeys get hurt in the process. Perhaps, but one should look at how broad the field of animal testing is, not just in Europe (which has some of the strictest codes of conduct in the world) but also globally. It’s quite straightforward to make the argument that experiment A leads to outcome B, and that outcome B (child walking, or cancer patient surviving) justifies the suffering caused to non-human animals in the process. What this ignores, however, is the extent to which practical benefits of experimentation can rely as much on basic research, with no specific objective as on more focused research. If animal suffering is justified by positive outcomes for human individuals, then experiments with no clear beneficiaries are, surely, much harder to defend, if one is to avoid simply defending all experimentation, no matter how seemingly outlandish, on the principle that it might, one day, be useful for something (Harry Harlow, anyone?). This approach to the argument also tends, from the pro-testing position, to a kind of a-la-carte utilitarianism. The example used in the review is a typical one. About 100 monkeys dying are worth thousands of people walking. Let’s assume that’s a fair trade. What happens, however, if we start playing around with the numbers? Are 100 monkeys dying worth 100 people walking? What about 100,000 monkeys against 20 walkers? What basis does one use to make such a calculation in the first place? If I’m in a wheelchair, how much suffering am I entitled to cause to benefit myself? Taken a step further, it would be interesting to see how far those who justify the suffering of animals on the basis that the gains it produces are so great are willing to pursue that line of thought. How many of those who argue that they only support or participate in animal testing because there’s no alternative, and that the suffering of animals is regrettable but necessary are vegetarians or vegans? Surely if one is going to endorse the utilitarian position, and reluctantly allow suffering so children might walk, one must realise that the amount of suffering caused by factory farming in no way justifies the pleasure one takes in eating meat (or, to be specific, the additional pleasure one takes in eating meat over eating something else). This is particularly true when one considers that the production of meat is a massively inefficient use of natural resources, as well as being extremely damaging to the environment. A more fundamental basis for supporting testing on animals is the simple belief that humans are intrinsically more valuable than other species. It is this principle that underlines all animal testing, indeed, all uses of animals (very few, I’d guess, would support the experiments above if it was 100 humans sacrificed to allow hundreds, or even hundreds of thousands, to walk). However, it’s not a principle that, I think, can survive real scrutiny. One can easily point to certain characteristics that, on the whole, humans possess and non-human animals don’t: a wide range of emotions and desires, capacity to empathise with the emotions of others, ability to think in terms of abstract concepts, an understanding of oneself as an entity existing in time. These are all, I would argue, valuable characteristics and tend to make the existence of one who possess them ‘superior’ (for want of a better expression) than that of one who doesn’t. If one wants to avoid irrational, quasi-religious justifications for our superiority, these are the kind of attributes one might evoke. Two main problems arise with this line of reasoning, though. Firstly, we now know that many species of non-human animals do possess these characteristics, to greater or lesser degrees. The Great Ape Project, which argues that basic rights, akin to ‘human’ rights, should be granted to particular groups of primates, is founded on this very premise. If the kind of qualities listed above are what make us human, and therefore entitled to specific protections (including protection against being experimented on) then how can experiments on non-human animals who share the same characteristics possibly be justified? The second point is a linked one: the kind of qualities cited to distinguish humans from non-human animals could equally be used to distinguish between different humans. Humans who have suffered severe brain damage, or who were born with serious neurological abnormalities may very well lack some or all of the abilities listed above. Although we may consider their quality of life to be poor, or inferior to the norm, there’d be very few who would seriously argue that they’re fair game for experimentation. And if we’re appalled by the suggestion that someone with a lower mental capacity than, say, a pig could be used for organ donation while still alive, why does the idea that genetically modified pigs could be used for the same purpose in humans not fill us with the same revulsion? That is not to say, however, that I’m unequivocally opposed to animal testing. In fact, intuitively I’d tend support it in many circumstances (including the sacrifice of the 100 unfortunate monkeys). This is the same moral intuition that doesn’t allow me to support the use of the profoundly mentally-impaired in the same kinds experiments. Luckily, though, I don’t think moral intuitions are always necessarily correct, and I’d be of the view that if one is going to support scientific testing on ‘higher’ animals, one should also be prepared to support testing on human animals of the same capacity. That’s, of course, only dipping my toe in the greatly complex debate on the subject, the nuances of which tend to get suppressed in favour of a good old punch-up, which each ‘side’ screaming at the other. The public face of the anti-testing position, if it isn’t violent or quasi-violent organisations like the ALF, unfortunately tend to frame the debate in terms of the reliability of animal testing. This seems a bit absurd, if not dishonest. While there is a case to be made for the alternatives to animal testing, certain activists would have you believe that animal testing is completely worthless and done pretty much just for kicks and giggles on the part of sadistic scientists who care less about achieving results than about inflicting pain and suffering. This kind of disingenuous scaremongering does nothing to progress the anti-testing argument, and serves only to cloud the fundamental ethical issues at stake. On the pro-testing side (or one of the ‘sides’) we seem to be seeing the emergence of an odd coalition, led by the Little Atoms/Revolutionary Communist Party view of the world, which defends animal testing in the name of defending ‘science’ and ‘inquiry’ as if this were some kind of freedom of speech issue (although, of course, for the nutters at Spiked, everything is a freedom of speech issue). While they might acknowledge that there is a reasonably plausible argument against animal testing, they tend not to engage with it, preferring to spout vague platitudes about ‘the Enlightenment’, forgetting that the overthrow of the theistic view of the world led not just to a revolution of scientific understanding, but also of ethical reasoning. Let’s hope that tonight’s programme tackles the thornier aspects of the argument, rather than being an excuse for a bunfight. A little more honesty, a little more reflection and a little more debate from all involved would be nice. Posted by franklittle in Ireland, Irish Politics, Uncategorized, United States, US Politics. It probably won’t get a lot of notice in the United States, let alone reach the ears of what passes for the media in this country, but last week 5,300 poor, working class, mostly Spanish speaking janitors and cleaners won a major battle in Houston, Texas, one of the least organised parts of the US. After a strike lasting over a month at some of the biggest cleaning companies in Houston and during which protestors were trampled by police, the fastest growing union in the US, the Service Employee International Union achieved a victory that will see wage increases of a staggering 126% for workers over a two year period, health insurance at only $20 a month and, for the first time in the working lives of many of these people, paid holidays. It is the first city-wide trade union contract in Houston’s history. For many of these workers, the deal has the potential to make a life or death difference in their lives. For the 1.8 million strong SEIU, it’s another vindication of their decision to become an organising union, which has seen them become key players in the Change to Win federation which broke away from the AFL-CIO, the US equivalent of ICTU. The chief reason for the disaffilation of half a dozen large and small trade unions was the continuing decline in the numbers of unionised American workers, and the seeming reluctance of the AFL-CIO to put a real focus on organising non-unionised workers. With less than 12% of US employees in a union, less than 8% of private sector employees, a crisis point had been reached. The Change to Win Federation requires at least 75% of the federation’s resources be allocated to organising programmes, getting full-time union activists on the streets, recruiting members, training activists, fighting campaigns and, most importantly, winning campaigns. All very interesting in a broad lefty fashion, but why should Irish workers care? Because, our own union leaders are paying attention. The ATGWU has set up organising units in Britain that have been very successful, one in the North that is just getting off the ground, with a unit in the South planned for the New Year. SIPTU has had an Organising Department up and running for well over a year and talking recently to one of their Organisers she was pleasantly surprised at the open-minded attitude to joining a union on display. She pointed to a recent academic survey (Can’t find the link but think it was UCD) that found 76% of non-union employees in a unionised workplace had never been asked to join, and 40% of them were willing to do so if only asked. Her experience tallies with that. She recounted the tale of another workplace where Irish workers who’d brought her in believed a union couldn’t be formed because the Polish workers there had no interest in it. Discussing it with a Polish colleague (Yes, SIPTU has trained Polish speaking organisers) she hoped would come out to talk to the Poles and encourage them to join, she was astonished to discover the Poles in that company had also been talking about bringing in the union. They didn’t think the Irish would be interested. Even more interesting than these anecdotal straws in the wind, members of the SEIU and the Change to Win federation were present at a number of recent SIPTU regional conferences talking about the importance of organising and recruiting, particularly in the low-paid private sector. Classes and training courses on recruitment and organising are being pushed aggressively by the TUC in the British union colleges. As the US labour leader John L Lewis was wont to cry, ‘Organise the unorganised’. Inhabitants of the Cedar Lounge take note. Where’s your union card? Posted by franklittle in Uncategorized. less hospital beds today than 20 years ago, even with the advancements in medicene, is ludicrous. People want more money for schools because they send their children off to pre-fabs. A teacher in a Gaelscoil in Cabra was on Radio na Gaeltachta last week saying that in all but one of his 20 years teaching since 1986 he had taught in pre-fabs. More money in capital school buildings, better schools, healthier children, happier staff. Logic. speaking, take one look at those proposals and run screaming because the politicians know something the ivory tower academics don’t know. There are no votes in dealing with crime in Ireland. There are no votes in ‘law & order’ in Ireland. Only votes in the perception of dealing with crime, in projecting the image of being the law & order party. It is in this light that serendipity brought together in the last fortnight two of the stupidest policy initiatives proposed since the last election, and from the sameparty, on roughly the same issue. First we had Billy Timmins. For those of you who hve never heard of him, and outside of political nerds that is all of you, he is Fine Gael’s spokesperson on Defence. The man charged with the onerous task of marking Willie O’Dea. He proposed setting up boot camps for young offenders run by the Defence Forces in order to teach them the error of their ways. Never mind that this intiative was tried by the British a few years back and was a catastrophic failure. Never mind that in the US it has been increasingly discredited because of the high rates of re-offending and abuse of prisoners. Never mind that Labour and the Greens would never allow such a policy to be implemented. Never mind what it says about our Defence Forces that Timmins thinks this is the best use for them. It SOUNDS good. It doesn’t matter whether it works or not because we know it doesn’t. It doesn’t matter if it’s a waste of the people’s money. It allows Fine Gael to pose tough on crime. And that’s the important thing. could have just driven the van up to his local community centre and off-loaded 450 AK47s. Both of these Fine Gael TDs can be given a fool’s pardon. Should Fine Gael get elected to government for the first time in over two decades, it is unlikely either of them would make it into the Cabinet. But it is symptomatic of the desperate flailing about of a party that has consistently built itself on two key foundation stones; law & order and anti-republicanism. Fine Gael is badly outflanked by the PDs on both issues. McDowell has looked across to Britain and intends bringing us Anti Social Behaviour Orders (ASBOs). Another failed Blairite proposal. Mandatory sentences are also on the cards. Neither of these work. Both have been demonstrably shown to fail. But this is not important. Both are possible vote winners. Rehabilitation, education of prisoners, tackling socio-economic disadvantage, more Gardaí on the street instead of filling out forms, a properly resources probation & welfare service. These work. We know they work. Fine Gael and the PDs know they work. But they prefer the easy option. They prefer to be soft on crime, soft on the causes of crime, because being hard isn’t as popular. Lastly, Gay Mitchell’s decision not to contest Dublin South-Central. No clearer signal could be sent of the growing acceptance among people in Fine Gael that they are not going to be in power in August 2007. Okay, this is becoming a habit in terms of opening sentences, but poor old Michael Richards. Kramer as he is known to hundreds of thousands of Seinfeld fans has covered himself in something less than glory over the past week after letting loose during a stand-up routine at some black members of a Comedy Club audience with a stream of racial epithets. Neither clever nor charming. Indeed quite the opposite. But it raises interesting questions about the way in which we can (or can we?) detach the artist from the art. I’m not about to destroy my Season 1/2 and 3 DVDs of Seinfeld because he’s done this. I doubt I would, short of the entire cast making a similar foray into the world of racial (im)politics. And that tells me something about myself which has – if not troubled at least somewhat exercised me for a while now. At what point do I stop watching television if an actor has made offensive comments? At what point do I stop listening to music if the musician or singer is a racist? At what point do I tear an image down if the artist has similar beliefs, or close the book if the writer holds utterly contrary viewpoints to mine? I’m slightly eliding a spectrum of issues there, with reference to viewpoints as distinct from say overt racism, but even so the question remains. A couple of examples. Ian Curtis of Joy Divsion, was in his personal life, given with other members of JD to making racist jokes and jibes, at least so the biography written by his wife Deborah tells us. Unpleasant. And the ‘playing’ with Nazi iconography is equally so. Various members of MC5, the Stooges and Led Zeppelin appear to have had an almost neanderthal approach to women. Although it’s fairly probable that any group of people given the adulation they were would be prone to excess. Still, that’s merely a none-too-clever way of excusing things. And what about those who hold views that some may merely disagree with. The Chameleons are very well-regarded round these parts, but anyone considered their spin-off band ‘The Sun and the Moon’ and the lyrics of the song ‘The Death of Imagination’? In neither case am I making any value judgement about songs or topic, both are powerful with more thoughtful than they scan on first view lyrics, other than to point out that tastes can run counter to worldviews. The Manic Street Preachers perhaps exemplified this on their visit to Cuba some years back where they were patently aware of, and perhaps even a little embarressed by, the contradictions of their visit and their revolutionary chic. Actually, I have to be honest, I quite like some Rush tracks, despite my better judgement, particularly their last but one album. You see? You see? That’s how it works. Rush may indeed plough a furrow of Objectivism (apparently best exemplified by Neil Pearts book on his travels in Africa), but still there’s something there that makes me listen and enjoy – at least up to a point… The Pistols remain a great band, as do the Chameleons, as does Joy Division. Simon Schama’s Power of Art on Friday Night on BBC had an hour long appraisal of Vincent Van Gogh. Van Gogh, played appropriately enough by Mr. Intensity Andy Serkis with a fetching ochre beard was in his earlier years a fervent preacher of the Protestant faith who was forced from that job due to being ‘overly zealous’. I actually like many of his paintings, but I’m not sure I’d have much liked him had I met him. To some degree we live in a world where comedy, in particular, has shifted towards almost ‘playing’ with these concepts of acceptable and unacceptable. Larry David has made a career out of swerving towards this territory in both Seinfeld and his own show. But that’s the difference, of course, one is a show, the other is – as Michael Richards has no doubt learned all too well – reality. A rather less forgiving reality than the one depicted in the Office, Little Britain or indeed Larry David. Posted by WorldbyStorm in Libertarianism, Marxism. Poor old Milton Friedman, barely shuffled off his mortal coil and already they’re out in packs to pull him off his philosophical perch. Still, I can’t entirely blame Friedman or the Austrian School (well more precisely the Chicago School) for falling in part for Pinochet’s rather dubious charms. It’s the old problem with ideology. It tends to hoover up enthusiasm and credulity in equal measure. I’m sure they thought all their Christmases had come together when they got the call to fly south to the balmy climes of Chile and chat with the General’s more intelligent associates. A country to play with. Real live working institutions to dismember and reconstitute. A state which appeared willing to try out radical experimentation…and all in the name of that most nebulous of concepts – economic freedom. I’d have been excited, and darn it all I’m just a libertarian socialist (or is it a social democratic liberal – so difficult to tell these days). That the Chicago School made much less of an impact in Chile than was hoped for, despite the current revisionism which seeks to portray the current reasonably strong economy as the result of all their hard work in the 1970s (a likely story if ever I heard one) is neither here nor there. But to my mind if one wants to see the real, the very real, dangers of ideology untrammeled by consideration of genuine human need we can do little better than consider how innately decent people such as Friedman (and I think also of Marx), who thought long and hard about the nature of freedom and the necessity for new ways of organising society, even if the conclusions are not much to my liking, could lend intellectual support – even at arms length and indirectly – to actions which would cast a long shadow over any reputation. Posted by WorldbyStorm in Democratic Unionist Party, Ireland, Northern Ireland, Republicans, Unionism. Every once in a while I cast an eye across The Cadogan Group website. And highly educational it is too. The Group was established in 1991: “by a small number of academics and others in Belfast unhappy with overall government policy on Northern Ireland, and with the broad analysis of the problem shared by the United Kingdom and Irish governments and by many commentators”. And what is the source of their unhappiness? Why the Peace Process. Or more specifically the inclusion of Republicans within that process over the past fifteen or so years. I should like these guys. I really should. Their civic Unionism isn’t without worth. They are reasonably progressive on social issues. They think about the issues and they treat them seriously. Despite thinking about the issues deeply their thoughts always seem to arrive at a rather familiar destination. And the name of that destination appears to be the retention of the traditional Union and a sorta kinda diluted majority rule. Okay, they sugar the pill somewhat in that they seem willing to countenance reaching out to moderate Nationalists such as the SDLP. But in effect their solution is the same solution as was presented by successive British Governments in the 1970s and early 1980s. A local assembly which would attempt to bring the more ‘reasonable’ elements together and exclude the wild men (aka Republicans). Now history hasn’t served them well with the rise and rise of Sinn Féin to the point of eclipsing and surpassing the SDLP. Their document ‘Beyond Belfast’ written last year appeared to be unable to countenance the idea that PIRA would disband, or rather it appears to have been written at two different times. In one part it was predicated on a stalemate lasting into the future (and reiterating the idea that it was impossible and immoral for Unionists to sit in government with former PIRA members) since PIRA wouldn’t disband. Then at the end it implicitly notes PIRA disbandment but again claims that it’s impossible for Unionists to work with SF in the absence of any expression of guilt over the past or a renunciation of violence in the future. The Cadogan Group argues that -ahem – “This whole question of consent needs to be re-examined.” and that “As we have argued, what is needed is a clarification of nationalist aims short of demanding that unionists be absorbed into a united Ireland against their will.” Now this isn’t explicit in the text but it appears to move towards a position where any nationalist ambitions in that direction must be stymied. The Agreement is beyond repair. Two lessons should be gleaned from the experience of the past decade. [from] concessions to the men of violence resulting in a worsening polarisation of political life, and rampant paramilitary criminality. …temporary accommodation. Under the Belfast Agreement the fundamental divide over the existence of Northern Ireland was papered over by complex institutional arrangements and formulations intended to please both sides but in reality serving only to heighten expectations on one side and fears on the other. A settlement is possible. Even today people from both communities in many parts of Northern Ireland live and work side-by-side without acrimony. It is only in the sphere of politics, and in the working-class ghetto areas, that the constitutional issue dominates, and corrupts both public life and community relations. Remove that issue and much becomes possible. Nationalists, including Republicans, say they accept Northern Ireland is part of the United Kingdom by virtue of majority will. In other words the issue is settled, at least for the foreseeable future. Yet nationalists continue to make the elimination of Northern Ireland their primary aim, the focal point of their politics. So long as that continues, there will be no normality and little prospect of cross-community power-sharing. A change of focus which would give priority to making Northern Ireland a better place for those they represent, rather than pursuing the unachievable aim of making it disappear, would be a start. Well to respond to the individual points, their ‘peace of a sort’ is actually a considerable measure of peace – certainly the largest measure in the six counties since the late 1960s. The concessions paid off, one of the most intractable paramilitary organisations in the world disbanded. Polarisation of political life was there before and remains, and only the most dreamy eyed idealists in Unionism could possibly believe otherwise. Paramilitary criminality does of course exist, but largely PIRAs disbandment has not led to any increase – the opposite if we are to believe the IMC. Their proposition that a long term settlement cannot be built on a temporary accommodation is simply an opinion – nothing more. The divide exists, attempts are still being made to bring about some sort of engagement. Perhaps they’ll succeed, perhaps they won’t, but the current situation is on almost every scale better than it was ten years ago. The idea that a settlement is possible is correct. But the idea that constitutional issues are the only ones that actually cause the ‘pain’ in the North is facile. Cultural and socio-political baggage on both sides is another stumbling block which even a comprehensive agreement will not ameliorate in the short term. Moreover it’s ludicrous to suppose that only nationalists place the constitutional issue at the heart of their politics. The same charge can be made with equal validity against Unionism. Worse, they deny the legitimacy of Sinn Féin at every step, even in the context of the disbandment of PIRA. I want to give some of the questions that they raise quite validly in their document, because these are crucial for Republicans and Nationalists to consider and give some of my thoughts first on them. Is an unrealistic adherence to Irish Unity worth more decades of communal antagonism? Naturally not. But unrealistic in what sense, is it any more realistic to propose that Nationalists will somehow stop being Nationalists and how then does community antagonism subside? Is it time that more discussion was held on the linkages between the aspiration to Irish unity and communal mistrust and the street level sectarian outrages practised by extremists on both sides but particularly by loyalist paramilitaries and their supporters? A very good question that works both ways. Does ‘Irishness’ have to be linked to an independent Irish political entity? Many Irish people remain thoroughly Irish while living in Great Britain or other parts of Europe, or America or elsewhere. How much easier could it be to be Irish in that part of the island called Northern Ireland, linked culturally and in a thousand other ways with the rest of the island, just as many, including Protestants and even unionists, have already found? Again, more good points. Yet evading a central issue. The relationship is not simply one located within the island, or NI, but one that Unionism sees as being linked to the rest of the UK. That’s entirely understandable, but to ignore that relationship is to ignore a central aspect of the dispute. And of course one could ask why is it impossible for British people to feel any less thoroughly British outside of Britain? Does Britishness have to be linked to a Union between the UK and NI? If it is felt to be impossible to be fully Irish without being able to give full allegiance to an Irish state, the same would be true of unionists if they were forced against their will to be part of a non-British state. What answer do nationalists have to the charge that this would merely substitute one injustice for another? Here again I’m in complete agreement. A traditional UI would indeed simply replace one injustice with another. If Northern Ireland exists by virtue of the will of a majority, as the Belfast Agreement says, then its existence is legitimate. Can an argument based on the injustice of Partition remain valid? If it is not, then what is the basis of a demand for unity? Well, even if we agree that NI can exist on the basis of the will of the majority in NI, that alone doesn’t predicate against lobbying for a UI, or indeed an NI linked into the UK. The basis of a demand for unity can be made for numerous reasons – such as logic, economic development, historical continuity etc etc. These reasons may be of varying substance, but they can clearly be made. And again, turn it around, why not ask what is the case for Union with the UK? Let’s be honest, both are in some respects simply preferences, where logic can be utilised to argue in favour of one or other outcome. All nationalist politicians continue to insist that if 50% plus one voted for unity in a referendum, it should happen. What would be the moral argument for incorporating, without their consent, the 50% minus one opposed to it in an Irish Republic at some future date? Would the action of exchanging a disaffected nationalist minority in one jurisdiction, the UK, for a disaffected unionist minority in another (the Republic) solve anything? Would not a demand for re-partition of Northern Ireland have a stronger moral base? Is the aspiration really territorial rather than a wish for a culturally Irish people to live in an Irish state? Who knows? It’s no doubt a mixture of both. But no more or less rational in it’s own way as the Unionist argument. Could it be that the policies of both nationalist parties put short-term triumphalism based on unionist discomfiture above the real interests of the nationalist community? Well now, that is a charge that could as easily be directed right back at Unionism. But implicit is an idea that Nationalism has lesser validity than Unionism as a concept. In a way all this reminds me of the response of the WP and DL to Sinn Féin when it moved slowly towards a non-violent stance. The response was one of first incomprehension, then disbelief, then denial and finally – and as has been seen expressed in the attitude of many within Labour from a DL background – enduring suspicion. Rather than approval, or even support, that the right course has been taken, the approach is one that refuses to believe change is possible or that an engagement between those of sincerely held Republican views and those of sincerely held Unionist views is possible – or more likely desirable. I don’t want to go into the enjoyably utopian proscriptions to the Unionist parties (inaccurately entitled Redefining Unionism) – other than noting that the DUP is advised to “place top priority on ridding itself of its Paisleyite image. Whether by persuasion or pressure, it should change its leader. A party still led and dominated by its founder after 35 years invites doubts as to its democratic nature. In the context of Northern Ireland its does not help to have the largest unionist party led by a Protestant clergyman known for his unremitting denunciation of the Catholic Church and its doctrines.” However, they do advise that the UUP: “Since Irish unity is no longer a practical danger, for demographic or any other reasons, should commit itself more fully and enthusiastically to cross-border cooperation, and to institutions which can be shown to serve a practical purpose in promoting and organising such cooperation”. And, tellingly, that’s it on suggestions regarding the internal nature of this new Northern Ireland that strangely seems very like the old Northern Ireland. There’s no real sense that they have any ideas as to how NI would become more comfortable for the Nationalist/Republican population to live within in terms of symbols, structures and so on. There is no real mention of an all-island dimension and far too much emphasis on the Union. Moreover they appear no more realistic in their pious hopes that non-constitutional centred politics can develop in the context of their posited transformation of Nationalism into something radically different, than successive generations of Republican Socialists who were always waiting for the millennial breakthrough that would herald a unity of the working class on the island and were always disappointed. History, their Unionist history, proves them wrong. Normal politics never developed in Stormont, not because of an IRA campaign that was largely dead from 1922 through to the early 1950s, but because ‘constitutional’ (albeit majoritarian) politics lay at the heart of Unionism itself, as much as Nationalism, as it had to – since Unionism is a nationalism – in such a way that even with a clear majority they sought to reinforce and supplement it to the detriment of the Nationalist population. And they’re remarkably introverted in that they entirely discount the experience within the broader United Kingdom where constitutional issues are not without a certain traction. The real problem is that they’re blind – well I’m sure they’re not – to the reality that Unionism is a British Nationalism as much as Nationalism/Republicanism is an Irish Nationalism. Neither is valid or invalid. Both can be argued for within their own terms and without. The trick is to produce structures that provide the much vaunted ‘parity of esteem’ for both nationalisms, and that’s why the contemporary situation is so radically different to previous incarnations of Northern Ireland. A localised political entity with links south (while the representational link to the UK is retained) is a different class of animal from anything previously experienced on the island. But for such structures to work one has to engage with those who represent the people within the North. And consider this, these are the ‘modernisers’, arguably the closest thing to post-nationalist that you’ll find in the Union camp. I don’t want to dismiss what they have to say. They do think about the situation. They are representative of a certain strain within Unionist thinking. Much of what they say is clearly easily integrated into any progressive program. But…they demonstrate the mountains to be climbed. The DUP more advanced than the Cadogan Group? Sad, but very possibly true.